“Radar Love” was a hit by the Dutch rock band Golden Earring. The song is considered by many to be among the greatest “driving songs” ever due to its lyrics about driving all night, its up-tempo beat, and its catchy sing-along chorus. The song reached #13 in the US. 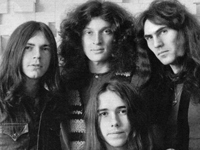 Dutch and German fans knew Golden Earring (and their early incarnation The Golden Earrings) as a second-tier pop/psychedelic group dating back to the mid-1960s, but for most listeners in the United Kingdom, United States and Canada, the first exposure to the group came in 1973 with the crashing 14-note guitar-and-cymbals introduction to “Radar Love” on the local top-40 radio station. “Radar Love” is that rarity of the early ’70s: a song that works both as an extended, “progressive” album track and as a hit single. Golden Earring‘s 1973 US album Moontan, itself a reworking of an earlier European release, was targeted at the then-expanding FM progressive rock radio audience and seemed an unlikely source for a breakout hit single: five extended jams averaging over eight minutes per song. An unknown engineer took “Radar Love”, which at a relatively compact six-and-a-half minutes was already the tightest of the album cuts, excised the instrumental solos (save for a drum-and-synth break which became the focal point of the short version) and tightened the opening and closing, creating a single half the length of the original jam. Lyrically, “Radar Love” is a tale of late-night driving and ESP; the real attraction is the non-stop parade of musical invention, from the aforementioned intro and drum solo to the twin guitar responses to each vocal line in the last verse to the cascading synthesizers that crash the tune to a close. Golden Earring wouldn’t have another stateside hit until 1982, with the MTV-ready “Twilight Zone”, but “Radar Love” remains a rock radio staple and their defining moment. The song has been covered occasionally over the decades, including versions by White Lion, U2, R.E.M., Blue Man Group, Def Leppard, James Last, Santana and Ministry. The band White Lion recorded a cover of this song for their album Big Game. It was included as a playable song in 2007′s Guitar Hero Encore: Rocks the 80s. * This song is featured in the Sega Genesis version of the video game Rock N’ Roll Racing, while not in the Super NES port. * “Radar Love” features prominently near the beginning of the 1993 film Wayne’s World 2. * The song is featured in the 1999 film Detroit Rock City when Trip throws a slice of pizza out the passenger side window of a moving Volvo and onto the windshield of a car full of “Stellas” and “Guidos” causing a confrontation. o “Bart on the Road”, where it is on the radio during the road trip. * Portions of the song were used in Téa Leoni’s sitcom The Naked Truth as the theme song. * The song was used in a video of a training exercise with the Oregon Air National Guard. * The song is used as a part of the ambient soundtrack around Rita – Queen of Speed at Alton Towers. * The song title is used as the name of an episode in the popular web series Red vs. Blue. * The song was briefly featured in the 1999 film Pushing Tin.